It is said that 1 in 20 people will be diagnosed with colon cancer. My grandmother was one of those people, and so was Christina Thompson, the owner/founder of Golf4Her, an e-commerce site for women’s golf apparel. Christina beat this disease, while building the Golf4Her business, thanks to early detection. March is National Colorectal Cancer Awareness Month and Christina and Golf4Her are at the forefront of increasing awareness and promoting early detection. Colon Cancer Alliance National Dress in Blue Day kicks off the month of awareness on Friday, March 1st. I will be wearing blue this Friday and on the course this weekend. I encourage you to do the same. Please spread the word and encourage your friends, colleagues, golf group, Twitter and Instagram followers and Facebook friends to join you. Golf 4Her is running special programs throughout the month to raise awareness and to supoort the Colon Cancer Alliance (CCA). Use the code BLUE13 when ordering from Golf4Her and receive $5 off until the end of March. Golf4Her then donates this $5 to the CCA. This is what I call a win/win/win situation. The CCA gets $5. You save $5, and you get some great new golf apparel for spring from brands like Jofit, Golftini, Loudmouth, Sunice, Tommy Hilfiger, Fairway Fox and more. 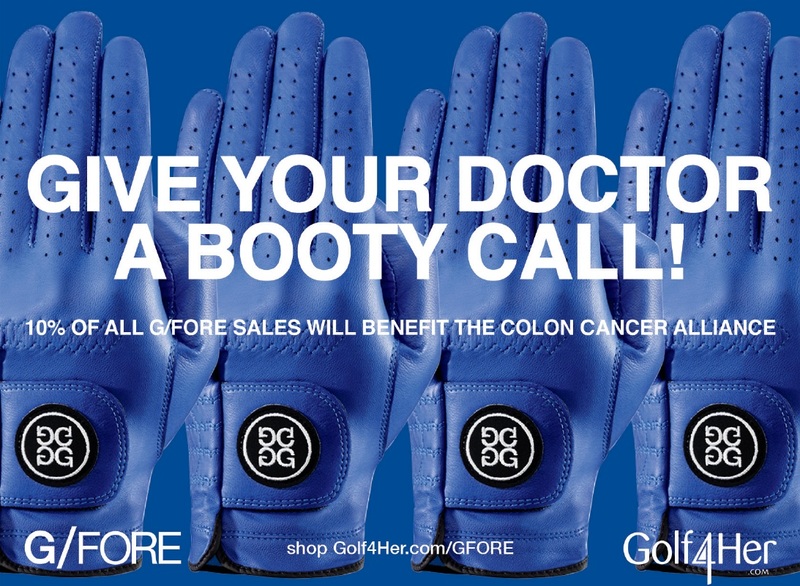 Also, fashion-forward glove brand, G/FORE, is joining Golf4Her in the fight against colon cancer. 10% of all G/FORE Azure glove sales through Golf4Her in March will benefit the CCA. Ladies, this is a great opportunity to get a new outfit for the upcoming season. Guys, this is the perfect chance to surprise your wife/mom/girlfriend with some stylish new apparel while supporting a great cause and a great company that gives back to the community (Golf4Her also recently became a sponsor of The Cactus Tour and sponsors several aspiring LPGA players on The Symetra Tour). Visit Golf4Her.com for more information. Golf4Her is also active in the social media space, so follow them on Twitter, Facebook and Instagram. When you visit them on Facebook, be sure to let them know who you are wearing Blue for this March. You can also visit the CCA website to make a donation or learn more about how you can help increase awareness. Thank you for wearing blue, spreading the word and supporting a great cause this month. It is brilliant to use a wonderful sport to help to raise money for a good cause from selling golf wear to support it, well done! This is a great idea for a great cause. There are so many ways to promote Cancer awareness, I usually like to do so with Cancer Awareness Ribbons . It would be great to get involved with more interactive ways of spreading awareness like this. Thanks for sharing.